Hey, you know that exciting strategy announcement Tesla boss Elon Musk tweeted about yesterday? No, it's not about the Model X or a switch to exclusively using Hemi V8 engines. It's about warranties and loaner cars. But it's still kind of cool. 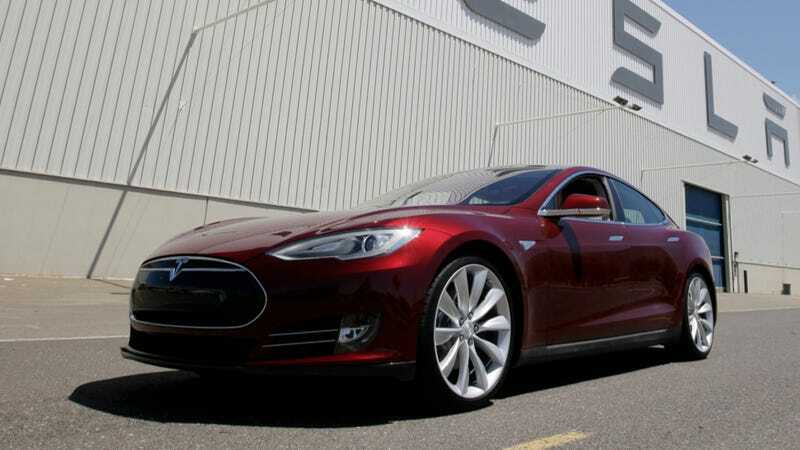 Now, when you need to get your Model S serviced, it will get picked up by a Lexus-style valet service that leaves you with a top-of-the line $87,000 Model S Performance, the company announced in a news release today. And if you live in "most markets," you can opt for a sporty Roadster instead. In addition, they're making their $600 annual service optional, whereas previously it was mandatory to keep the warranty in place. You're now still covered by warranty if you opt not to pay that. Nice. And speaking of warranties, they say they will honor the battery's eight-year warranty for any reason besides collisions. Also nice. None of this is terribly exhilarating news. Nor is some of it even truly news — Musk has been talking about adding Model S-es as loaner cars for weeks now. But if you're a Tesla owner, some of these announcements may serve to make your life a little easier if your car needs service. And it's one more sign that Tesla is moving beyond being just a scrappy startup and becoming a real car company with services that can compete with the big luxury brands. They're still small and still getting there, but it's hard to deny how far they have come.